Screams Off Screen: Annabelle | Bloody Good Horror - Horror movie reviews, podcast, news, and more! Note: Screams Off Screen is a regular feature committed to exploring the true stories that inspired horror cinema’s darkest minds as well as the urban legends spawned by its most iconic films. In each installment, we’ll venture beyond the safe glow of the screen in order to come face-to-face with the monsters lurking at the intersection of fact and fiction. Along the way, we’ll meet small town ghosts, souls whose quest for fame began after they died, and other all-too-real reasons to be afraid of the dark. That doll’s story starts in 1970 when a nurse named Deidre received it as a birthday gift from her mom. Shortly after she brought the Raggedy Ann doll home, Deidre and her roommate Lara noticed it had some unusual habits. Every morning, before leaving for work, the girls would leave the doll in the same place (on Deidre’s bed), in the same pose (its floppy arms at its sides, legs straight out). Where the doll would be when they returned home, however, would be a surprise. Then, the notes started to appear. Deidre and Lara would find small pieces of parchment scrawled with messages like “Help Us.” A medium told them the spirit of a young girl named Annabelle had fixated on the doll and wanted permission to live with Deidre and Lara. They agreed, which only made things worse. After Lara’s boyfriend Cal got too close to the doll, suffering two sets of claw marks across his chest, the women reached out to a priest. The priest, in turn, contacted famed paranormal investigators Ed and Lorraine Warren. Convinced the presence that had infiltrated Deidre and Lara’s apartment was demonic, the Warrens took the doll, by then known as Annabelle, and sealed her in their occult museum. Annabelle’s story doesn’t end in that glass case. Hollywood came calling for the Warrens, seeking to bring their fantastic and frightening tales to the big screen in 2013. Of course, it was only natural Annabelle – who Ed once called “the worst thing we have in this whole museum” – would go along. 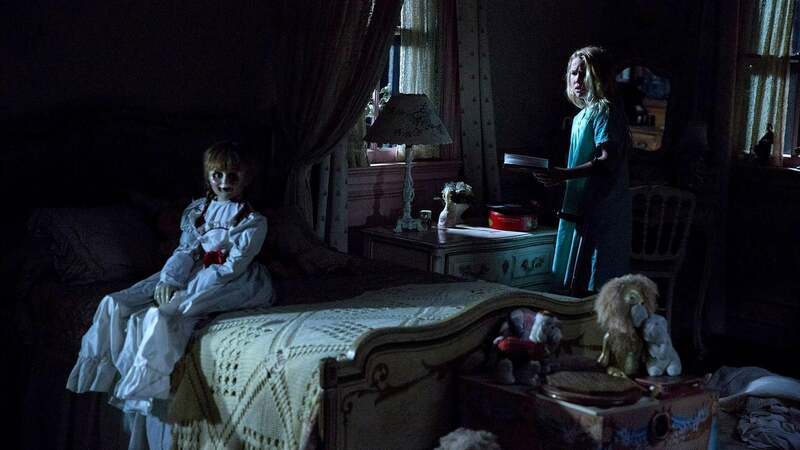 However, the Annabelle that made her cinematic debut in 2013’s The Conjuring, was about as far from Johnny Gruelle’s Raggedy Ann as possible. Licensing issues forced director James Wan and his team to reimagine the toy terror. On-screen Annabelle is porcelain-faced and almost fragile. However, any hint of vulnerability is erased by the sinister streak in her glassy eyes and toothy smirk. Despite the extreme makeover, this new version of Annabelle seemed to retain some of her forbearer’s negative energy. Prior to the theatrical premiere of her first solo movie, its production team circulated stories about strange on-set incidents. Crew members found what looked like claw marks drawn in dust. An actor was injured when a lighting fixture fell on him as he waited for a scene to begin, a scene that coincidentally took place in the exact spot where his character was scripted to die. The Raggedy Ann doll in the Warrens’ home and museum has inspired almost four decades of nightmares. Those credentials are impressive by any standard, but they’re even more considering the subject is an almost aggressively unassuming toy. Is Annabelle’s long legacy of horrors proof to never to judge a book by its cover? Maybe. Or maybe a better lesson to take away from Annabelle is that stories, even if they’re hard to shake, aren’t always true. History has shown that Annabelle (and those who know her best) may not be the most reliable narrators. For example, you could choose to believe the aforementioned origin story. Author Gerald Brittle included it in his celebrated biography of the Warrens, “The Demonologist.” Or, you could accept the one Ed Warren shares during a videotaped tour of his and Lorraine’s museum. In that version, Annabelle’s otherworldly tendencies first manifest in a far more dramatic fashion. One morning while seated with the nurses for breakfast, the doll’s arms jutted out and came to rest on the table. Other, less theatrical, differences exist. In some versions, Annabelle is a birthday gift and other times she’s a Christmas present. Also, depending on the telling, her human roommates either go by Deidre, Lara and Cal or Donna, Angie and Lou. It’s important not to hold these inconsistencies against Annabelle, at least. She is, after all, a product of her nature. Embellishment, much like a close relationship with the macabre, is a surprisingly common theme in Raggedy Ann’s history. Those rumors about Raggedy Ann being modeled after a child’s corpse? They can be traced back to Marcella Gruelle’s untimely death, the likely result of an infection she picked up from a vaccine she received in school. The legend goes that Johnny, in his anguish, fashioned Raggedy Ann as a grim recreation of his daughter’s final days as a warning to other parents about the dangers of vaccines. At least, that’s the version favored by those who share Gruelle’s beliefs. In reality, Gruelle applied for a patent on the character’s design almost half a year prior to Marcella’s tragic passing. So, maybe the best lesson Annabelle, and Raggedy Ann before her, have to teach us is that it never hurts to let facts get in the way, no matter how good the story. Brittle, Gerald. The Demonologist: The Extraordinary Career of Ed and Lorraine Warren. Graymalkin Media, 2013.